01-010 Clutch Kit: AMC Eagle, Jeep Cherokee CJ7 Scrambler Wagoneer - 9-3/4 in. 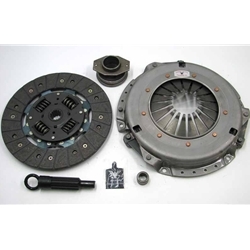 This is a stock replacement clutch kit containing only quality tested components. The original stock pressure plate and woven organic disc are ideal for maintaining the smooth engagement and reliability you are used to from the original clutch when the vehicle was new. This is a direct stock replacement clutch kit and will not require any modifications during installation and includes all necessary components when replacing your clutch. 9-11/16" x 14T x 1"
Refer to the technical bulletin TB002 regarding the way to avoid a release problem on this application.